Offers CD and DVD duplication and printing, plus data storage solutions. Backup, data interchange, tape drives, tape library units, tape autochangers, and tape arrays. Creator and manufacturer of DLT tape, 4mm tape, 8mm tape, CD-R, DVD and Zip disk data storage media. Backup, data interchange, tape drives, tape library units and tape autochangers/arrays. A complete line of automated tape backup solutions including tape libraries and tape media. Tape drives, link extenders and tape encryption products. LTO provides high-performance tape storage technology. Ultrium and Accelis tape formats allow high capacity or high performance tape backup solutions. Products include single, dual, multiple drive and library units utilizing DLT, AIT, MLR, Mammoth and Magstar drives. Also tape bus extenders, switches and tape encryption devices. CD-R duplication and CD printing machines, has teamed up with CD-Lab to bring you any CD solution you may need. 9-Track tape drives and software for backup, data interchange and storage management. Also 3480, 3490, 3490e tape drives and tape drive accessories. Manufactures robotic tape libraries for the computer data storage market. Their tape libraries utilize the latest generation of tape drive technology to provide unattended backup for midrange and enterprise systems. CD-R duplication and replication, CD printing, mastering, and packaging. Sales of blank media and Rimage CD-R production equipment. Tape based file system for Windows 95/98. It creates a drive letter for your DAT 4mm DDS tape drive which behaves like a disk. Allows Windows applications to access files directly on the tape volume. Tape backup solutions for Windows 2000/NT, Linux and NetWare network tape backup. NovaBACKUP automatically backs up your computer to just about any tape drive, disk, removable, CD-R/RW, or DVD drive. IBM TotalStorage Enterprise Tape Drive 3592 replaces 3590 MagStar with a non-compatible tape cartridge format, just as MagStar replaced 3480 a decade earlier. Originally code-named Jaguar. z/OS tape storage and disaster recovery software, especially for VTS (virtual tape) environments. Provides tape, media, file and data conversion services for magnetic and cartridge tape in all formats. Quantum Super DLT tape drives, media, autoloaders and libraries. Manage your CD or tape collection. FreeDB access and tape length calculator. Windows shareware. Provides data storage solutions, including disk storage, disk backup, external tape drives, tape backup, tape libraries and autoloaders. Offers media duplication for CD, DVD, audio and video tape. Also provides multimedia authoring and A/V equipment such as projectors and tape duplicators. Manufacturer of tape backup solutions specializing in emulations, sharing tape drives and display units for most platforms. Storage solutions that combine automated tape libraries, tape drives, disk arrays, networking products, software and consulting services. Complete tape backup solutions using DLT, AIT and LTO tape drives and libraries from Quantum, ALT and Overland Data and software from Veritas and Legato. IMdrive will restore, convert and duplicate data from a wide range of standard and proprietary magnetic tape formats. Handles IBM, 3590, Unix, DAT and others. Information storage solutions that combine automated tape libraries, tape drives, disk arrays, networking products, software and consulting services. line of automated tape backup solutions, including the AIT BullFrog, the worlds first fully-integrated Fibre Channel tape library with AIT technology. Sells and repairs tape heads, tape drives and hard drives for the computer, video and banking industries. If the business hours of Techware Distribution in may vary on holidays like Valentine’s Day, Washington’s Birthday, St. Patrick’s Day, Easter, Easter eve and Mother’s day. We display standard opening hours and price ranges in our profile site. We recommend to check out techwaredist.com/ for further information. 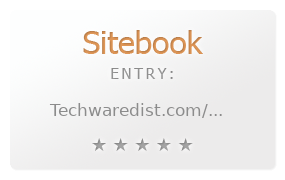 You can also search for Alternatives for techwaredist.com/ on our Review Site Sitebook.org All trademarks are the property of their respective owners. If we should delete this entry, please send us a short E-Mail.